Ohio's new secretary of state sat down for an interview about elections. 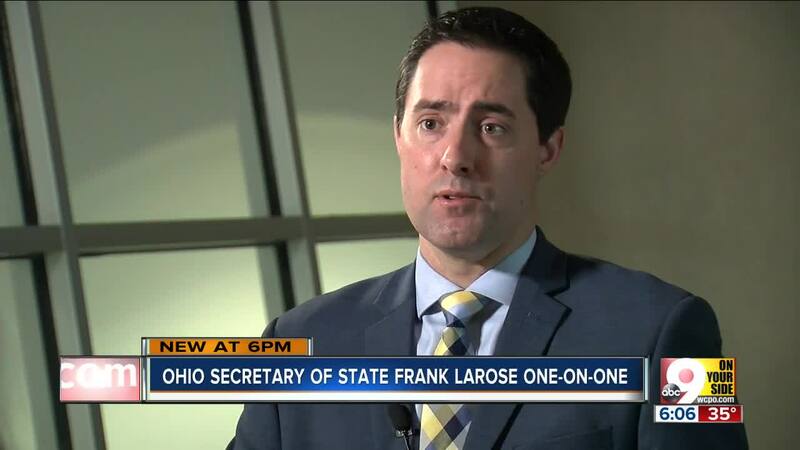 CINCINNATI — One month into his new role as Ohio's Secretary of State, Frank LaRose is making changes and looking ahead to the 2020 presidential election. First among those changes: Working with other parts of the government to encourage high voter turnout among all Ohioans, whether they are Republicans, like him, Democrats or members of another party. "I was proud to run as a Republican and my beliefs generally align with the Republican principles and that's my ideology," LaRose said. "But when it comes to governing, compromise is not a failure. Compromise is how statesmen and women solve problems. And we need to bring that back." Even before he was elected in November 2018 to serve as the state's chief election officer, LaRose was fighting for voters. He sponsored a bill last year as a state senator from Hudson to replace or repair every voting machine in all of Ohio's 88 counties. State lawmakers passed Senate Bill 135, which allotted each county a fixed amount based on the county's size. In all, $114.5 million was allocated for the new machines, and $10 million was reserved to reimburse counties that had already purchased their own replacements. "It's great to watch it coming into fruition," LaRose said. Hamilton County Board of Elections workers spent Wednesday unpacking, and testing the new machines. Director of Elections Sherry Poland said the county received $7.2 million because of LaRose's bill. Voters will first use the machines in the May election, which Poland said is a small roll-out because there aren't many precincts with items on the ballot. The real test will arrive in November when all 562 precincts in the county use the new machines. Poland said the voting process will be the same for voters, but the machines look a bit different. The machines that actually tabulate votes were also replaced, and machines called "disabled access units" for people who need assistance are also upgraded. All machines have the most up-to-date security features. "We need to have the most secure, the most efficient machines in Ohio," LaRose said. "And it's great that we were able to, thanks to the investment that the legislature made...that means that throughout 2019 we're going to be able to get them up and running and make sure that our poll workers are comfortable with how they operate for the very high-demand 2020 presidential election." On Monday, LaRose also announced he's going to reach out to approximately 270,000 people who were purged from Ohio's voter rolls in early January by his predecessor-turned-Lieutenant Governor John Husted. Husted had previously sent those voters "last chance" notices before their names were purged from the rolls. Hamilton County Deputy Director of Elections Sally Krisel told WCPO approximately 17,000 of those are in Hamilton County. "We want every Ohioan who is able to participate in our process, every Ohioan to be a registered voter," LaRose said. "The reason why I'm sending these registrations out is because if these individuals have been removed from the rolls and they want to be registered voters, we want them to be registered voters." Both federal and state law require purging of voter rolls, LaRose said, and Husted followed the law. However, he wants to make absolutely sure every eligible person in Ohio wants to vote has a chance to do so. He stopped short of calling this a "double-check" on those names. "That's one way to look at it," he said. "Or, a new start." He also weighed in on Sandusky, Ohio's recent decision to make Election Day a government holiday. "Interesting idea," LaRose said. "Maybe something worth trying. I'm skeptical about whether it results in more people voting, but if it does than that's a great thing."